The Witch is a 12" figure sculpted from puppen fimo. She has beautiful orange glass eyes that sparkle when the light hits them. Her hair is lamb's wool. I dressed her in burnt orange shantung, velvet and a black antique handkerchief. Her hat is made of felt and trimmed with gauze and glass beads. 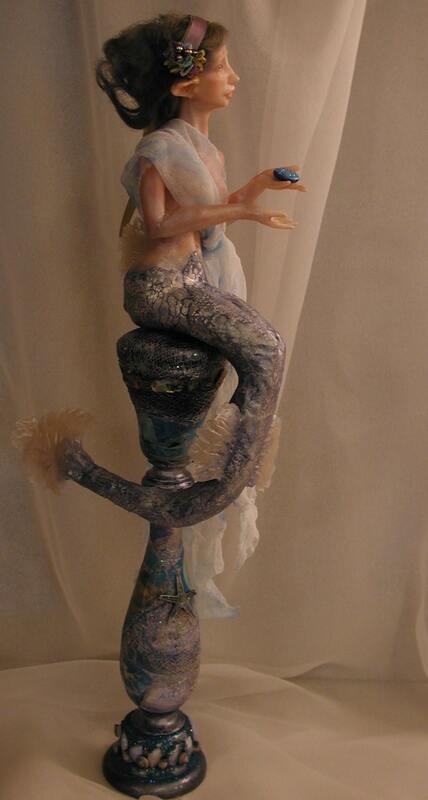 Her glass globe is on a stand sculpted from apoxie sculpt. Hanging from her waist is a glass bottle that holds her magic potions and some skull heads. The Fairy Clown is a 9" figure with a soft body over a wire armature. Her head, legs, feet and hands are sculpted from puppen fimo...she can be posed. I dressed her in a Royal purple silk velvet with blue buttons and a belt of hand dyed lace. Her hair is Tibetan wool dyed purple and blue. She has blue and purple glass eyes. She is sitting on her own chair which is 7" tall and sculpted from apoxie clay and painted different shades of purple, glue and gray. Her beautiful iridescent wings are of mixed media. The Fairy Clown hanging half doll is approximately 18" from the top of her head to the bottom of her silk gown. Her head and hands are sculpted from porcelain puppen fimo and she has tibetan wool for her hair. She has grey glass eyes. I dressed her in pleated silk fabric and she holds a beaded hanging crystal. Her hair is covered with a cotton Venice lace. I did some beading on the front of her sash and she has tiny tissue paper wing that glitter. My Santa is riding in a sleigh made by David Schump. The Santa is sculpted from puppen fimo with a poseable cloth body. He is dressed in hand dyed wool and sports a lamb's wool beard with hand painted eyes. The sleigh is pulled by 2 vintage celluloid reindeer. I filled the bag on the back of the sleigh with handmade pieces and vintage pieces. He is one of a kind. This Santa Claus is 12" in height with sculpted head, hands and shoes from polymer clay. He has a cloth body on a strong wire armature and stands with brass rod and tubes so he can be removed from the stand. I dressed him in antique burnt orange silk velvet, wool, antique cotton and mink fur with beading for his cap. He has hand painted blue eyes and lamb's wool for his beard and hair. He holds a gold antique pick in one hand along with an old bell and the other hand carries antique tinsel with glass balls and a tiny bear. Other toys include a train and wood dolls. This tiny Princess is 7" tall and sculpted from "Living Doll" over a strong wire armature. She is dressed in antique lace fabric with silk wings that are the image of butterfly wings. Her headdress consists of iridescent beads. She stands on a hand made mosaic base designed just for her. . This 12" Santa has a sculpted head of puppen fimo with hand painted eyes and beautiful mohair for his beard and hair. He is dressed in red wool trimmed in a faux fur and gold trim. His bag is a dark green felt with vintage toys...his mittens are also dark green felt and he holds a grape vine wreath decorated with fruit, berries and leaves...the fruit, leaves and berries are also used to decorate his cap and bag. He is OOAK and has already left for his new home. If anyone is interested in commissions, contact me through this website. This piece is 10" high with a 4.5X6.5" base. The base has been crackled and antiqued. On the base is a vintage plastic reindeer decorated with a wreath, leaves and pine cones and a vintage bottle brush tree with glass balls ,and I placed some tiny birds on the branches. The Santa head is sculpted from Super Sculpey with hand painted eyes and beautiful lamb's wool for hair and beard. He has a soft body dressed in a soft fabric and trimmed with a faux fur. I put plenty of German glass glitter and mica all over for a Holiday sparkle. He is on his way to his new home for Christmas. This Santa is approximately 12" Tall and stands permanently on a Birch Wood base. I sculpted his face from Living Doll polymer clay and gave him real glass blue eyes with lamb's wool for his hair and beard. He is dressed in a soft white fabric with a faux fur trim. His bag is filled with vintage miniature toys and hangs from a beautiful sparkly vintage red trim. Plently of German glass glitter and mica was applied to give him a wonderful shimmer and sparkle under the Christmas lights. This is a 9" figure sculpted from porcelain puppen fimo. She has green eyes and white Tibetan wool hair.. She is dressed in silk with antique lace..her hat is felt and her wings are a delicate medium decorated with German glass glitter. Her staff is sculpted from translucent premo with a black wash and has an ivory skull on top. Hanging around her waist is another ivory skull and an old key. She stands on her handmade mosaic base with the rod and tube method. The diameter of the base is approximately 4" and the entire piece from the tip of her hat to the bottom of the base is 12".. The Moth Fairy is a tiny 7" figure sculpted from puppen fimo. She is dressed in hand dyed silk gauze and silk. Her wings are real feathers and her hair and boots are mulberry paper. She stands on a base decorated with glass irridescent tiles and decorations hand sculpted from apoxie clay. She is one of a kind (OOAK) and will be traveling to her new home.. The new shelf is up and filled with my paint bottles of acrylic paint; easier access and easier to see the color I need. A new figure emerging on the sculpting table that has changed several times as to what she will be when the final sculpting is completed. The new yarn holder I purchased from Lucky Stradley really works! !....now I do not have yarn balls falling on the floor and rolling all over the place....love it. Took a walk in the yard. Our winter this year down South has really been cold; but, our Johnny-Jump-Ups (violas) are still surviving and looking pretty good considering the cold temps and the snapdragons are hanging in there. Until later...when the new sculpt is finished.. Here is wishing a Happy and Healthy New Year for everyone in 2014. This is the shelving unit we will add another shelf for paint. A new confortable chair for my computer and desk. New Drafting chair for my sculpting table. Christmas is here once more....certainly rolls around fast...down sized the decorating a little...The tree we had was just too heavy to get down and drag into the house, so we purchased one that is more of a slimline and much lighter to carry. As the years go by, we will probably end up with a small table model...In the meantime, I do enjoy getting out the ornaments and decorating the tree...brings back many memories of the past. Merry Christmas to all...have a wonderful Happy and Health New Year. I have so enjoyed creating this Wizard. He is a 12" figure with head, hands and shoes sculpted from puppen fimo with a cloth body. I dressed him in silk and silk velvet with hand beaded trim from India. His dragon is sculpted from paper clay and painted with pearl ex paints to give him a wonderful glimmer. He stands on a handmade base of iridescent mosaic tiles trimmed with apoxie clay. After sculpting this dragon, I have decided after the New Year I really want to sculpt a larger dragon with a fairy riding on him...cannot wait to get started on that; but, in the meantime, I must start on Santas...I know I am late in starting; but things happen. This Centaur is a commission piece for a special lady to give to a special person....I really enjoyed sculpting it. The Horse is sculpted with apoxie clay over a wire armature for strength and then with paper clay. The human part was sculpted from puppen fimo. I do hope the collector will be pleased. I love sculpting with paper clay which is an air dry clay that can be carved, sanded and painted. For the past two weeks I have managed to sculpt 6 Halloween Ornaments, one Halloween Pumpkin Head Lady, a Santa Bust and make a Folk Art Dolly....the ornaments have already flown to a new home... I also made the tree stand to hang the ornaments on so I could photograph them and now I have orders for the stand... Have a commission to work on and a new Santa along with a tree stand...wish I could work faster than I do. Here is a group picture of the latest creations. Goblin Princess is now complete and already has a new home. She is a 9" figure sculpted from puppen fimo over a strong wire armature. She stands with the brass rod and tube method in order to remove her for shipping. She has hand-painted eyes and beautiful mohair for her flowing hair. I dressed her in antique lace with an overlay of a sheer gauze fabric and some German Glass Glitter for sparkle. The Goblins who are emerging from underground to scare the Princess are also sculpted from puppen fimo. The base is decorated with mosaic tiles and apoxie clay leaves and branches. According to the story, the goblins were absolutely hideous or ludicrously grotesque both in face and form. hmmmmmmmmmm I think my goblins do not fit that description. In fact when posting some WIP on Face Book, there were comments on how "cute the goblins were....I do not like ugly or scary and guess that is why I sometimes have trouble trying to create Halloween figures. This piece took me much longer than usual to finish...I had to redo the base twice in order to fit the goblins on it and dressing her was not easy for some reason; but, it all seems to have worked out in the long run. I had some yarn left over when I finished Miss Lilly's Afghan and saw this bag on the internet with instructions on how to make it...I have discovered, if it has Granny squares, I can handle it. Not sure how I will use this bag...right now it is just a decoration hanging in my studio. Now I have to find something else to crochet...I really like to have some crochet lying around so when I watch TV it gives me something to do...I cannot just sit with idle hands. Love these colors together. Here she is until I post further pictures of her. Finally finished the Snow Queen. She is sculpted from puppen fimo and dressed in white silk velvet with mixed media wings. Her throne is sculpted from apoxie clay and is decorated with mirror tile mosaic work along with the base. The Tree is sculpted from apoxie clay, painted pearl with an overlay of silver leaf. The branches are made from sterling silver wire with iridescent glass beads. As I have mentioned before we will be the Great-Grand-Parents of twin boys sometime in April. I finished crocheting the afghans for them from a soft snow white beautiful yarn..
And now I am working on an afghan for a Great-Grand-Daughter, Miss Lilly...many different colors crocheted into granny squares and out-lined in a cream. We love sparkle and lights. For the past few years we have been putting solar lights in the back yard which are so beautiful at night. Our screened in patio has wind chimes hanging from the eaves on the outside and we also hang them from the ceiling inside the patio. We now have a new addition of colorful lights hanging from the ceiling of the patio and they are beautiful at night. New lights hanging from the ceiling of the screened in patio. During the day without lights. I have several projects I am working on...I will be the great-grand-mother of twin boys who will be born in April, so I am crocheting white blankets for them...their sister and brother will also receive afghans this year. Miss Lilly will have one with many colors as you can see in the pile of granny squares...her brother Cameron will also have one in green. So, I have lots of crocheting to do in the coming months. And finally, my sculpting table that is rather messy right now while I complete her base with mirror mosaics for the Snow Queen Fairy. I am a little late in getting up pictures of our Christmas Decorations...but here are a few to enjoy...here is hoping for a wonderful New Year for all. This is my second Santa of the Year. Santa Claus is a 12" figure with a soft body and sculpted head, hands and boots over a wire armature. He stands with the brass rod and tube method and can be removed from his stand for shipping. I dressed him in handmade wool with a real mink collar. He has beautiful blue glass eyes and lamb's wool for his beard. The trim on his coat and cap is some antique trim I have been hoarding waiting for just the right figure to put it on. He carries a few toys in his back pack and there are a few on his base... OOAK, never to be created again. He is not a toy, but a collectible to be treasured for years to come. Santa can be found in my Etsy Shop....Santa has flown to a very special home. This tiny Christmas Fairy is 10" and sculpted from puppen fimo. I made green eyes for her with mohair lashes and dressed her in some fabric I had been hoarding for quite some time. The deep red silk velvet has gold overtones and I have two small pieces which I have been saving for just the right sculpt. The ruffled gauze fabric also is another piece that worked just right for her. Her wings are made from silk over wire and I used water colors on the silk until I got just the right depth of color and also applied a few feather and some glitter. The base has relief work on it of leaves and vines with embedded salt water pearls which I covered with multi-colored gold and silver leaf. I love doing mosaic work and for years have been making bases decorated with mosaic work for my dolls. Since I have almost daily been checking out Pinterest, I have been inspired to create some of the amazing projects I have seen there. My family use to bowl and when we stopped, we put the bowling balls out in the garden...anyway, after seeing pictures on Pinterest of bowling balls covered with mosaic work, I decided to do the same.....and here are the results. We had three of these Mexican jars and I put the bowling balls on top of the jars. This huge coleus has such beautiful colors and blends well with the sweet potato vine. Here is the other pot with the coleus and sweet potato vine. This one is in the shade more than the other pot, so I assume the coleus are shade plants. New gazing ball that is suppose to be solar and light up at night; unfortunately, it does not. This delightful hibiscus plant has bloomed its heart out; the plant has stayed the same size and blooms continuously.. This is the new hosta bed and seems to be doing really well. Oak Leaf Hydrangea with a climbing hydrangea behind it. Our garden last year, with the vinca growing around the fountain. This year we planted the trailing vinca twice and both times they died; have no idea what the problem was. Food and fun at the lake this week-end with family and friends. And to celebrate our Grand-son Brandon's 30th birthday. Very relaxing with good food and bonding with family. Have decided to make this an annual event. Aunt Diane helping Lilly with her bubbles and there is Barney.!! Nicki and Brandon enjoying the view while trying to catch a fish. Meme, Cameron and Lilly swinging...they had to have their life jackets on because the lake was so close to the back yard. Not to be out done by his daddy, Cameron pulls in a bream while Barney watches. Well, it looks as if Johnny has also had some luck...they did release all these tiny fish to allow them grow larger. I just finished a commission for a Grandmother Fairy and her grandbaby. Commissions always are hard for me because I am not sure I am doing what is expected....but, I have a wonderful collector who requested it and seems very pleased. ....thank you Judy M.
The first thing I did was make them a base decorated with mosic tiles, apoxie clay and polymer clay. I had purchased some new paints from Christi Friesen which were wonderful to work with...a whole new experience of making clay look like it was metal and rusty...must do more with these later. This Fairy is a 10" sculpt of puppen fimo with arms that can be posed. Initially I sculpted the arms and was not pleased, soooo I broke the arms at the shoulder down to about an inch about the wrist and then wrapped the wire with strips of batting and gauze...now I could pose the arms better and they were strong enough to hold the tiny baby fairy. I started out by hand dying fabric dark green...oh my goodness, these figures let you know when something is not right...it just was not working. So, I went with the softer greens and she and I were both pleased. Her hair which is dyed mohair was styled in many different ways, but the final style with a touch of grey seemed to work. Now it all was coming together and she was very happy. But there was the problem with the wings; the first set seemed to over power her, so I had to make a second set which fit much better. Yarn bombing, yarnbombing, yarnstorming, guerrilla knitting, urban knitting or graffiti knitting is a type of graffiti or street art that employs colorful displays of knitted or crocheted yarn or fibre rather than paint or chalk. Our winter was very mild and some plants managed to survive. Spring has "sprung" early and some people are already planting their tomatoes and bedding plants. Asparagus Fern that has completely filled this huge pot. Climbing Fern which is very invasive. I have become addicted to "Pinterest" a wonderful new website where people can "pin" pictures of items that interest them on a "board". There is everything under the sun on that site..from tutorials to beautiful pictures of garden, flowers, art work, etc. It is truly a place to become inspired...and I have started a new hobby...crocheting..I had no idea there were so many beautiful items being made from crochet...and there is freeform crochet, certainly works of art. I purchased two books and also found that you can actually get tutorials on youtube. What would I do without my computer??? So, my first project is covering a chair that is in my studio. This is not my idea, but saw it on Pinterest and immediately fell in love. Oh, if you want to go to Pinterest, click on that button on the left side of my blog and it will take you there.. This is a chair my daughter painted for me, so I hope she does not mind if I cover some of it with crochet...as soon as I have three more granny squares crocheted, I will put them all together to cover the seat. Stay tuned...I am having more fun with this. I love solar lights and we have managed to start a collection of them to put in our back yard...here are a few pictures of our lights at night. This summer, I plan to check out the stores and see what new lights may be on the shelves.